“‘Boondoggle‘, ‘Loss-making whim‘, ‘Monument to bad territorial planning’. . . Such are the arguments of high speed rail critics, as the United States finally gets on board the passenger rail revolution that is sweeping the world. But that quote wasn’t about the U.S., and it wasn’t about today’s debate. It came from an essay by José Blanco López, Spain’s minister of transport and public works, which was published in a new pamphlet from SERA, a sustainability activist organization within the government Labour party. He was talking about the two decades of opposition that conservatives had mounted against the country’s progress in building a high speed rail system. Starting with a line from Madrid to Seville in 1989, Spain pursued an aggressive and determined commitment to high speed rail that, by 2012, will produce the longest system in Europe. This year alone, most of the country’s €19 billion development budget will be invested in high speed rail. By 2020, López says, more than 90% of the country’s total population will be within 31 miles of a high speed train station. Shielded behind overly simple, short sighted cost-benefit analysis, critics complained with those arguments against high speed projects over years, until the success of each one of the new corridors proved them wrong and showed that in troubled economic times, the best investments for a society are the ones which improve equality. History has proved rail’s critics wrong in Spain, as economic development and rider enthusiasm followed it everywhere it went. Even so, ever unwilling to learn from the successes of the rest of the world, the U.S. is now starting the same effort at about the same place as Spain was 20 years ago. The president of the U.S. High Speed Rail Association, Andy Kunz, appeared on Fox Business last Friday to make his pitch. And what argument did the show’s overcoiffed co-host raise? “Amtrak has been in the red for years and years and years, and nobody in charge over there seems to be able to turn a profit, despite the fact that everybody I know takes the train from New York to Washington D.C., the Acela. It’s just not working though financially,” she whined. Be that as it may, one wonders why Europe’s success would not convince them that high speed rail would be a good thing for this country. A projection from rail proponents FourBillion.com indicates that building the 9,000 miles of high speed corridors identified by the U.S. Department of Transportation would create 4.5 million permanent jobs and 1.6 million construction jobs, save 125 million barrels of oil, eliminate 20 million pounds of CO2 per mile per year, reinvigorate U.S. manufacturing, and generate $23 billion in economic benefits in the Midwest alone—all alongside a long list of intangible side benefits. Putting aside the cretinous shortsightedness and obstinacy of conservative media, let’s take a look at what the rest of the world is doing. The UK’s Labour party is also pursuing an expansion of high speed rail, having commissioned a study on building a new line from London to the West Midlands and extensions to the north. Currently, Britain has only one high speed line, the 69-mile-long “High Speed 1” link from London to the aforementioned Channel Tunnel (“Chunnel”) to France. The Tories have offered their own £15.6 billion plan, so it seems likely that Britain will soon have a new high speed project. France, as I mentioned last year, already has the wonderful 200 mph high speed TGV network, with 1,100 miles of track, more than 400 trains and the third-highest ranking of rail passengers per year, behind Switzerland and Japan. Personally, I found it to be the most enjoyable travel experience I have ever had. This week, the Chinese government awarded a $4 billion contract to build 80 high speed (236 mph maximum) electric train sets for the new 3,700-mile-long high speed train network it is building. Half of the contract went to Bombardier Sifang, a Chinese joint venture with Berlin-based rail giant Bombardier Transportation (TSE: BBD.A). The company will begin delivering the trains in 2012 and finish by 2014—boom, done. Bombardier is already building 20 sleeper trains for China and another 20 passenger trains, in addition to the 500 high-power electric freight locomotives that it contracted to build for China in 2007. Meanwhile, Back in the States. . . Calling the U.S. “a developing country in terms of rail,” a Siemens representative told the New York Times last week that his company was a candidate for a proposed high speed link between San Francisco and Los Angeles, along with Bombardier and Japanese bullet train manufacturer Hitachi. The California line is on the short list of high speed rail priorities prepared by the America 2050 group, ranking it fifth nationally in terms of ridership demand behind four other lines for the Northeast. 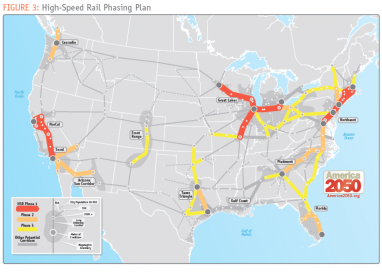 High Speed Rail Phasing Map by America 2050. Source. SCNF, the French company that runs the TGV network, has submitted its own plan to the U.S. Federal Railroad Administration (FRA) for four 220 mph corridors in California, Florida, Texas, and the Chicago-Midwest area. The company believes it could open the first line from Milwaukee to Detroit by 2018 and be in full operation by 2023. The costs would be recouped quickly, according to SNCF, returning triple the $69 billion cost of the Midwest corridor within 15 years in environmental and other benefits. Building America’s high speed rail network will be expensive—about that, there is no disagreement. The $8 billion appropriated for high speed rail in the stimulus plan was dwarfed by the $103 billion in applications the FRA received for the funds, and is a small fraction of what the total network will cost. The California run alone will probably cost over $40 billion to construct, and that’s after the state’s existing commitments to building support networks and light rail links. On the other hand, as the director of the BART light rail system pointed out this week in his testimony to San Francisco city supervisors with the city’s Peak Oil Preparedness Task Force, the U.S. currently spends as much on parking as it does on national defense. I haven’t run the numbers, but it seems within reason that if that is the case, spending that money instead on high speed and light rail would cover a very large part of the total cost. Indeed, all of the cost arguments I have heard against rail are incomplete and wrong. The true costs of remaining committed to our current road and air infrastructure are never taken into full account. . . like the health care costs of polluted air; the cost of continuously maintaining roads, bridges and tunnels; the availability of materials (remember, several cities in America literally could not buy asphalt during the oil frenzy of last year, because refiners were cracking every last lighter molecule they could from the crude); the trillions of dollars we are spending on oil imports and defense operations in oil producing regions of the world; the billions’ worth of damage that our current ways do to the environment; the insurance costs of keeping up 240 million cars and light trucks; the damage and death that those millions of drivers cause; and so on, ad infinitum. Rail is cheaper, safer, and better on every single count. When the boundaries are properly defined, the entire transformation of transportation from liquid fuels to renewable electricity would create millions of permanent jobs, and could probably pay for itself. But the cost isn’t really the point anyway. America still has no energy plan, let alone a plan to address the looming threat of peak oil. With the decline of global oil production starting around 2012 already “baked in,” due to a lack of sufficient oil megaprojects, we desperately need to start making tracks toward a high speed rail infrastructure, or face a painful future of fuel shortages and economic dislocation (at best). No part of our transportation system is as vulnerable to volatile fuel prices as the airline industry. It was built on the expectation that oil would rarely cost more than $40 a barrel, and it is completely dead if oil stays over $100 a barrel. Last year’s oil price spikes put many smaller carriers out of business and cost the major carriers billions. Then the operators who had the largest hedges against rising prices last year got whacked again as prices plummeted. For my money, the airline industry may as well be dead. Not just because of the damage that oil price volatility has done and will continue to do—and not just because the experience of air travel has become a painful routine of delays and personal insults—but because it’s so inferior in every way to high speed rail travel for distances under 500 miles. The TGV line from Paris and Lyons virtually eliminated air travel between those cities, and the high speed line from Madrid to Barcelona cut air travel in half in the first year of its operation. I continue to believe that rail—particularly high speed rail—is the longest safe bet one can possibly make. As I have explained in this column over the last several years, we simply cannot replace enough gasoline- and diesel-burning cars with ones that run on electricity to address the peak oil challenge in the time we have left. Like compressed natural gas vehicles, PHEVs and EVs are “silver BBs” that will help cushion the blow, but in the long term and for the majority of miles traveled, rail is truly the only answer. Rail is by far the cheapest and most fuel-efficient form of transport, requiring about a third less fuel than air for personal travel, and as little as 3% of the energy for freight. The rest of the world is already kicking our butts in deploying renewable energy. 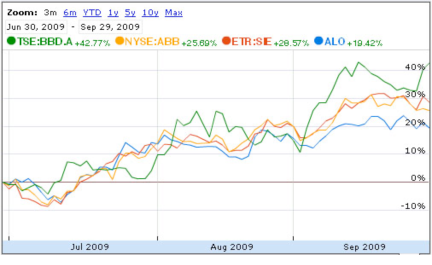 China is running circles around us in long term resource planning and buying up every hard asset under the sun. And compared with the rest of the developed (and developing) world, we’re bringing up the rear in rail. If you’ve watched any of the new Ken Burns series on America’s national parks, you know that protecting the common good has always been a struggle against vested interests and conservatives resistant to change. It took strong-willed men of vision like Teddy Roosevelt, John Muir, and Stephen Mather to override the opposition and do the right thing for the future. We need that kind of leadership now. If I were President Obama, I would direct the Department of Transportation to immediately begin transforming America’s infrastructure to one based on electric rail, regardless of the long-term cost, starting with the highest potential traffic and fuel savings and working our way down the list from there. I would do as the French did when they created the TGV: Declare eminent domain and lay in the high speed rails where they make the most sense. I would restrict federal funding for roads and bridges to critical maintenance projects where rail can’t take over the load in time—with not a penny more spent on new car-based infrastructure. I would forbid any subsidies for cars and trucks with a fuel economy of less than 30 mpg. I would move all subsidies for fossil fuels into renewable energy—then double or triple them—to ensure that we can run that new electric infrastructure cleanly. I would bind Congress to my purpose and ride roughshod over the objectors, making it my number-one priority. I know it may seem hard to believe with oil holding steady around $70 and gasoline around $3, but if you haven’t studied the data, then take the word of a guy who has: We’re in serious trouble, folks. The Armageddon of transportation is dead ahead and we need to move aggressively and determinedly to head off the peak oil challenge. Rail is hands-down our best and biggest shot. Energy analyst Chris Nelder takes a 100-year view on energy and wonders if the Obama infrastructure plan will guide us down the right path, or down the road to ruin. Energy analyst Chris Nelder takes a hard look at what “sustainable” really means, and questions the sustainability of realistic energy solutions. Perhaps human nature, not technology, is the real challenge that we face. and i don’t see much changing … america has to nearly die before the populace will wise up … look at california, even being broke is changing nothing in the most progressive state in the union .. In the 1950s, Eisenhower’s vision became America’s reality: Interstate freeway systems enable carbon-spewing passenger car travel and truck freight that increase our dependence on foreign oil. Meanwhile, air and train routes become prohibitively expensive — or go under. I would very much like to see someone research BART Board Director Tom Radulovich’s stat: “the U.S. currently spends as much on parking as it does on national defense.” It’s a fascinating comparison. I normally side with liberal issues, but this is one that I just can’t agree with. Just because the Europeans have a lot of ridership doesn’t mean that light rail is the MOST EFFECTIVE ANSWER TO OUR ENERGY PROBLEMS. To ignore the costs and mandate that a significant source of America’s investment capital should be diverted to serve a small proportion of our population under a misguided master planning arrangement will be catastrophic to America’s future productivity and national budget. For a sum that is much less than what would be required for Light Rail, we could dramatically improve the energy profile of our current automotive system; a system that allows people to dictate their own transportation solutions rather than be subject to the whimsy of governmental, bureaucratic system. As a resident of the Bay Area I’ve tried several times to use the mass-transit option available, but THEY FAIL MISERABLY. I have zero confidence that committees of politically-appointed lackeys can make intelligent planning decisions. I point to the Bay Area’s own BART, Caltrains and Muni light rail systems as perfect examples of the reality of good intentions turning into significant, wasteful monetary burdens on our citizens. My wife tried to make BART a solution to commute into San Francisco. The faults and end-cost were so great that it actually made economic sense for her to drive and park in the city — a city with some of the highest parking costs in the nation. But even beyond arguing the cost, which one could argue may come down with ridership; the rest of the experience was a disaster as well. If I believed that opaque organizational structures could create efficient and effective transportation solutions that used precious tax-dollars in a prudent manner, I’d probably entertain the idea that light rail could be a solution. But history and reality shows us that it is not possible in today’s American cronyistic society. As an Independent, I am disappointed by the increasing evidence that the Democrats leverage of special interests only creates a different type of disaster through governmental control. There is no way I want this group mandating the expenditure of hundreds of billions, if not trillions of tax dollars. Gregory Lent comments about California going broke and I’m not sure he gets that it is going broke because of paternalistic misguided projects such as light rail in the Bay Area. Yes light rail is fun. I took the high-speed AVE from Madrid to Sevilla and enjoyed it. Is the romance of their solution enough to make it right for America? No way. The solution is fund enough micro-changes in the current architecture of transportation in America (automotive) that drive significant changes in energy consumption nationally. It’s already happening but more can be done. THIS IS WHERE OUR TAX MONEY SHOULD BE SPENT; ENCOURAGING CHANGES TO THE TRANSPORTATION SOLUTION THAT AMERICANS HAVE CHOSEN THROUGH USE OVER DECADES. The reason why Americans use cars is because it enables freedom in transportation which in turn enables freedom to find personal solutions to issues of work, play and travel. I am not an energy or automotive employee; my paycheck doesn’t come from anything close to those industries. I am a rational, thinking citizen that is terrified of the possibility that our country would waste significant, precious tax-dollars on an inefficient, restrictive an ineffective solution. Your loosely-coupled argument, while sounding nice is not sufficient to prove that light rail is a good choice. The reality that many people have encountered through actual experience is an effective counterweight to this feel-good argument.